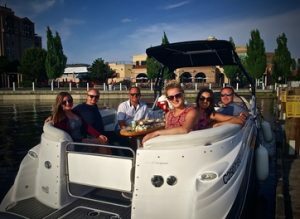 Private Boat Charter in Kelowna. All-inclusive up to 10 guests - Cheers! Private Boat Charter in Kelowna. Half Day. UNLIMITED PASSENGERS - 10 MAX! This tour is personalized for discriminating individuals who want unique, memorable experiences off the beaten path. This is your private Charter and you call the shots! On this tour, we go where you want to go and see the sites that interest you, or simply just float, swim and enjoy the music and your friend's and family. We cater to your groups individual and particular desires exactly... giving you the dedicated attention to make this day the one that you will talk about for the rest of the year! The entire day you will learn about where you are vacationing... Lake Okanagan and the Okanagan Valley... all about the fish, and birds we pass, to the amazing history and wineries that surround us... this is not a water taxi...we pride ourselves in sharing the Okanagan with you in a special and unforgettable way! This tour is most popular for a trip to Peachland and Rattle Snake Island! My family and I took a half day tour with Captain Rob yesterday and had a blast. The boat was very comfy and had plenty of room for all 10 of us, aged 7-70. Rob was very safe and responsible and had a wide variety of PFD sizes, even for our 7 year old. We toured up the lake with mountains and vineyards all around - so beautiful! We stopped for a swim and then the kids all went tubing - lots of laughs and great memories to take home with us! Thanks Captain Rob!